She signs the preface of these books with only her initials, F.S., so I assume that her married name began with the letter S. but could not find any other information about her last name or her husband’s last name. 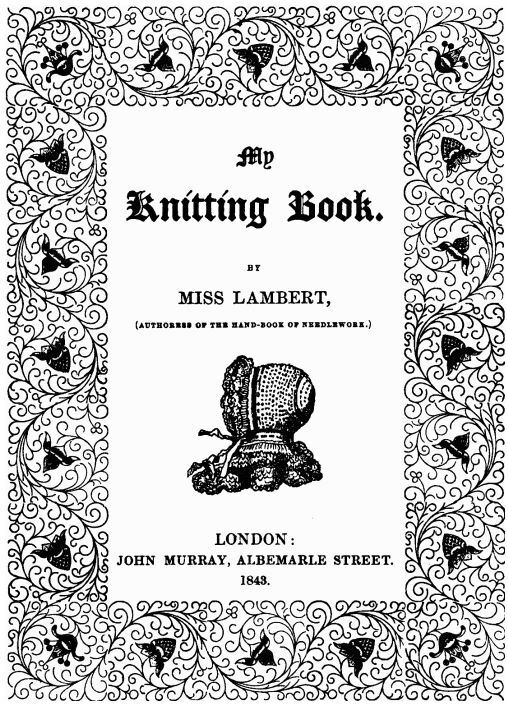 2) Miss Lambert ran her own needlework emporium in London, England. The first was located at 7 Conduit Street and she then moved to 3 New Burlington Street. A quick peek on Streetview on Google Maps showed that modern buildings have since replaced the Victorian aged ones; however, other buildings on the streets provide a hint to what the street may have been like during Victorian times. 3) Miss Lambert was a well known “brodeuse” and was an embroideress to Queen Victoria. My thought is that since she had an established reputation as an embroideress based on her maiden name when she published her first book in 1842, she may have been recently married at this time. 4) Miss Lambert was a woman who did groundbreaking work in the area of knitting publication. She is credited with writing the first practical needlework guide, with inventing the first standard knitting gauge (Lambert’s standard filiére) and with being the first writer to stress the importance of knitting tension. The information above was compiled from several sources including Victorian Needlework (Kathryn Ledbetter, 2012), A History of Needlework Gauges (Sheila Williams, 2006), and Hook & the Book: The Emergence of Crochet & Knitting in American Popular Culture, 1840-1876: Exhibition Catalogue (Nicole H. Scalessa, The Library Company of Philadelphia, 2001). Unfortunately, I could not find a photograph or image of Miss Lambert! < Previous Knitting for profit or leisure?